On Sunday 17th October members of the West Midlands IWW branch attended the Birmingham Bin Strikers Demonstration which was held in Victoria Square, Birmingham city centre, this is a report of the day and some thoughts. The mood was positive & vibrant in Victoria Square with a strong turn out of support for the striking refuse workers as people sang along to the bands performing protest songs in solidarity with the strikers. With a variety of speakers appearing to address the crowd to large applause condemning the treatment the refuse workers have had from Birmingham City Council, including a brief appearence from the Mcdonalds workers who had recently been on strike themselves as a show of support was warmly welcomed by the crowd. A variety of trade unionists, socialist, communist & anarchist groups turned up to the event to show support (and in some cases attempt to recruit). What we noticed was that political groups had set up stalls with information, petitions, donation collection pots but Unite, who are the union behind this strike, had not set anything of the sort up. This seemed like a lost opportunity to give out correct information about the strikers cause & we felt this was unfortunate given the fact that these strikers are up against the mainstream media & mixed public support. Unite should be taking every opportunity to raise awareness of this strike in a factual manner so people who may be unaware of all the facts can be exposed to them & they should be taking the opportunity to give information to groups who wish to get more involved in supporting the striking refuse workers. With the pressure of central government cutting more and more funding per year to Birmingham City Council we are seeing vital public services being stripped down to the bone. 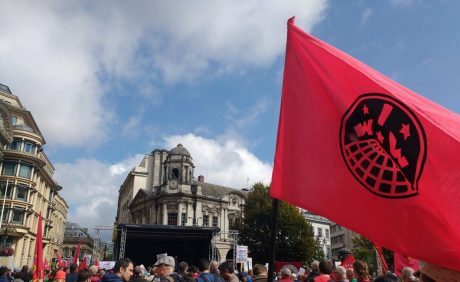 A more radical approach is required to tackle the affects austerity is having on workers & communities in Birmingham and the IWW are a union that can offer that radical approach.